Class leading sportsbike. Stunning agility. The best supersport bike in the world or a class of its own? 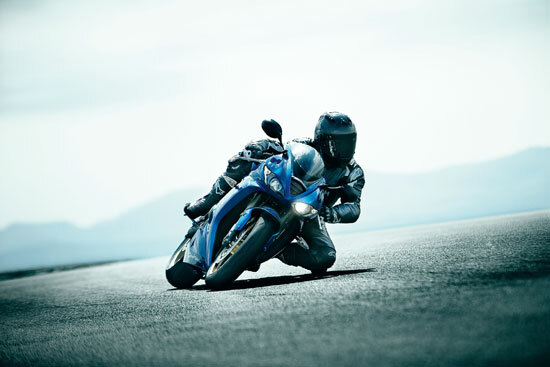 Designed for the racetrack, to compete with the best in the supersport class, Triumph’s Daytona 675 is the bike to beat on both the road and the track. 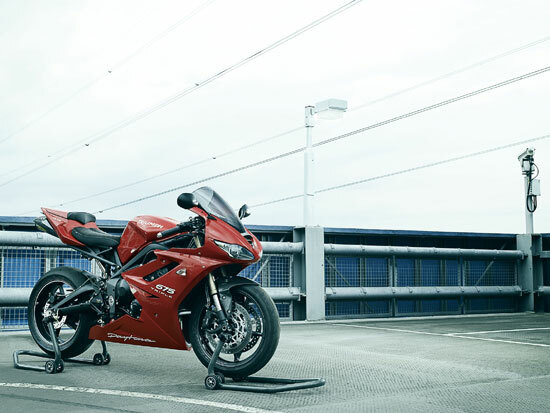 Winner of the 2009 Supertest ‘King of Supersports’ award (for the fourth time) and MCN’s Sportsbike of the Year, the Daytona 675 delivers a killer blow with its combination of outstanding handling and a storming three-cylinder engine. With the lightest and narrowest chassis in the class, the Daytona 675 delivers outstandingly agile and intuitive handling. Fully adjustable suspension front and rear, with separate adjustment for high and low speed compression damping, gives the Daytona 675 superb composure on all surfaces, while top-of-the-range monobloc radial brake calipers up front deliver eye-popping stopping power. But it is the engine that makes the Daytona 675 stand apart from the competition. With 126 bhp and more torque than the competition, the 675cc triple offers an exhilarating ride. With its unique, wicked three-cylinder howl, the Daytona 675 delivers an unadulterated experience like no other sport bike. Updates for 2010 include new instruments, decals and a new color option in Caspian Blue paint with gold wheels. 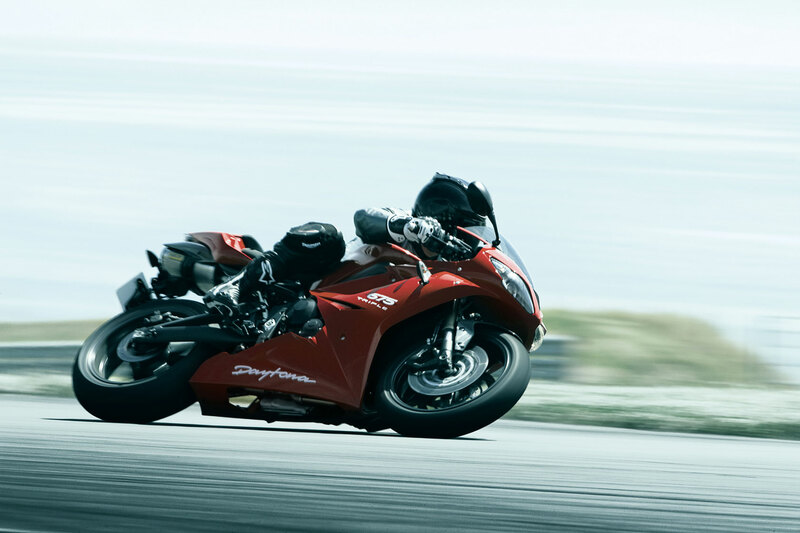 Triumph’s R&D department has taken an evolutionary approach with the 2010 Daytona, using experience gained from racing in the Supersport World Championship to develop the new machine. The latest specification 675cc three-cylinder engine revs to a 13,900rpm redline and pumps out a mighty 126 bhp. 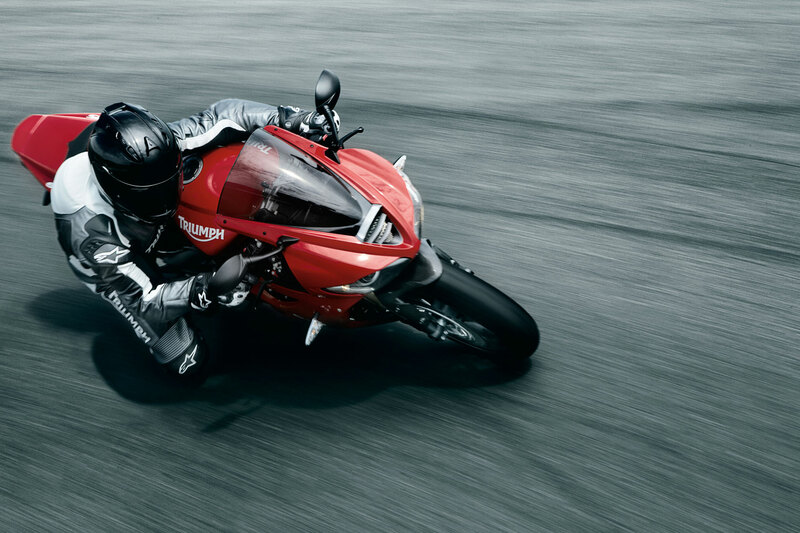 The Daytona 675’s aluminum frame is fabricated with open-back cast spars which wrap over the top of the motor, accentuating the benefits of the narrow three-cylinder design. The lightest frame in its class, it weighs in at a mere 19 lbs. The fully-adjustable 41mm upside down forks and rear monoshock unit both benefit from highly sophisticated high and low speed damping control, allowing riders to set their Daytona up with maximum accuracy. This track-bred suspension gives razor sharp handling and can be tuned by the rider to suit their own style. New radial-mount Nissin monobloc brakes are mounted to twin 308mm discs for stunning levels of stopping power and rider feedback. The Daytona 675’s digital instrument console has all the usual trip functions as well as displaying average fuel economy. Also featured is a sophisticated lap timer – useful for comparing successive lap times on a circuit as well as average and maximum speed for each lap.